Woops. There goes another winter. But at least it´s one of the coldest we´ve had for 20 years (and with snow forecast tomorrow) so should have got rid of a fair few bugs! Chris went to the Potato Day (which annoyingly coincided with my father-in-law´s birthday) and got me Sárpo Mira, Sárpo Una (new one, a red early!) and Kestrel. No Charlottes so will have to get those from the Hut. If in doubt, sow chillies. This time we sowed 2 seeds per module and used every packet we had. No doubt germination will be patchy, and we won´t get nearly as many up as sown. Which will be just as well, as we´ve sown upwards of 80 seeds! All put in the heated prop on maximum. First day and last day of Feb gardener... pah! But at long long last I was getting my hands dirty again. Negotiated a couple of hours and made it to the plots! 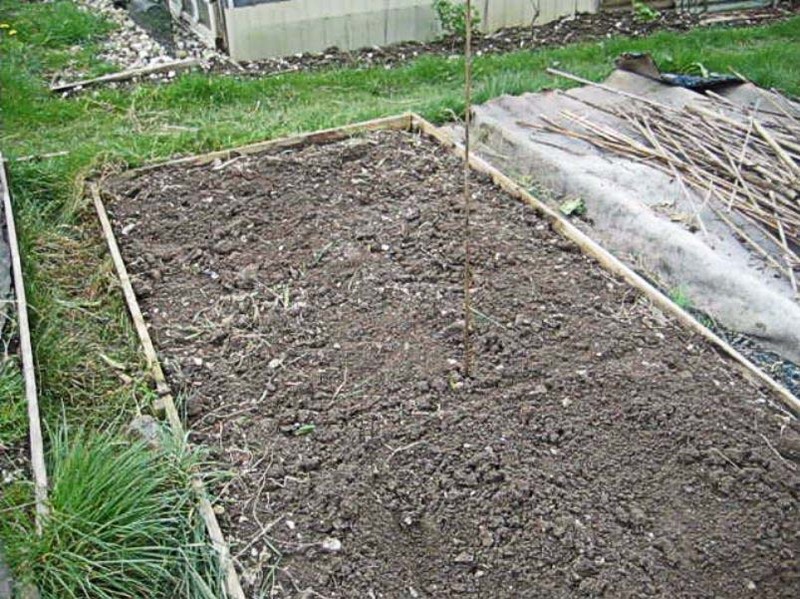 Decided I wasn´t going to let myself get depressed on the state of the place, just got going on weeding a bed. Almost by default I started with the parsnip bed, as I needed to dig up the self-set roots. Chris was up there and lent me a large fork, which was good as they were quite deep! Also dug up some surprise leeks - didn´t expect any of those! Took a break and pruned the autumn raspberries (urgent) and some of the summer ones (not so urgent as I just needed to get the dead wood out). Found something/one has dug up my tulips. Squirrels probably, when desperate for food in the cold conditions. Cabbages too were rather bigger than I´d expected with the minicoles being less coconut-headed than in the past. A couple of the reds had grown a lot since I last looked so they made it into my trug, which was by now getting quite heavy. Rhubarb crowns breaking leaf too. Major work to do before fruit bush leaf-break: flatten the blackberry which has gone totally out of control, ditto the blessed worcesterberries (hopefully giving one away to a lottie mate over in Watford once it´s been hacked a lot) and probably flatten a goosegog or two as well. They'll be back but they do need regenerating and I can´t think of a better way of being able to get at the inevitable bindweed that has run rampant for the past two seasons, to get it back into a manageable state. 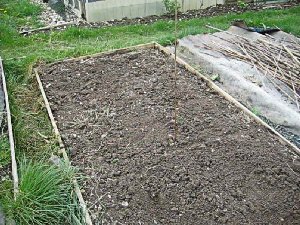 I didn´t even finish a whole bed of weeding but I did start with the ones that didn´t get weeded last summer, so they´re worse by definition. I need to make sure that every bed I weed gets covered in ground cover before I move on to the next one, so it stays controlled until I need it. I had a bonfire too. Quite a lot of dried haulms and bindweed (spit) so I shoved it all in a pile and incinerated it. Then went back to the weeding. I was shocked at how fast my time went, and got home only to discover small person asleep. Argh! Could have stayed another half hour. But used my reprieve to weed some of the front garden instead. Evening to-do list: update the planting plan! Everything´s been fallow for so long I can pretty much do what I like, so I can group stuff better. Start of a week off to do garden and allotment, after a truly glorious week of spring. So what do I get? Howling gales and forecasts of torrential rain. I do pick them! Way too windy to do what I need to do at the allotment, which is fight with ground covering fabric and dig some potato beds. So decided that I´d have to try and get up when I could find calmer conditions and spend today trying to get the garden into some kind of order, given that at the moment I have got a gate that has no catch, chaos behind the shed, a horizontal Christmas tree (I potted it up a bit too optimistically into a narrow-based pot and as I said, it´s *windy* out there), pots and pots and pots of dead plants that never got planted at the lottie last year, other defunct plants/annuals, pots which are just full of soil and weeds, empty pots... in short, a total mess. No good at all for having a toddler run about in. The other problem is bindweed in my raised west-facing bed, helped by an enormous clematis montana which is almost as invasive. So decided that was for the chop. An hour later (and a huge pile of tendrils) I had a very peculiar-looking side fence, bare. Decided to see if I could get it to burn, and succeeded in having a nice, wind-encouraged bonfire. Managed to get shot of a fair bit of wood rubbish thanks to that. All pots of compost and dead bits got emptied into a bucket and the bits put in the compost bin. The bucket had to be emptied a few times, mostly into borders, so they look a bit better too. Christmas tree was put into a large pot with carrying handles. After all, we´ll need to move it inside occasionally. Did a fair bit of weeding in that bindweed bed too, getting rid of way too many speedwell (which still haunt me) and other undesirables. By the end of the afternoon, the place still looked like a bombsite but at least I had bags of rubbish for the tip, some long-overdue repotting done and a start to the clearing. Still windy. Bah. Forecast showery as well, so got cracking and attached a catch to the loose gate. Now small boy can´t wander behind the shed. Moved the compost bin sideways, as it was leaning over and on a hump of earth. 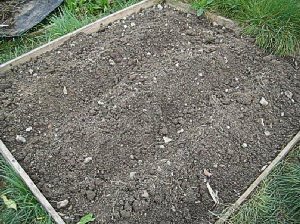 It´s now on the flatter soil by the shed, and the hump was levelled and spare soil put into dips, so the back is now looking rather flatter. Rearranged several old paving stones and parked the quince in the corner (where it can get sunlight), the Christmas tree next to it and then hid some of the junk behind the pots. Made the soil a bit too soggy by tipping over the tubtrugs which I´d stupidly left upright (and which were full of rainwater). Back of shed now half-decent. Humph. A dry morning at last - past two days have been atrocious. Frantic dump runs, and lots of washing pots. Finally have no rubbish down the side of the house, no pots or rubbish down the side of the conservatory, no pots in the cold frame (and that washed and weeded!) and the benches relocated to keep small boy off the raised bed. He is showing an enthusiastic but worrying tendency to eat soil! Have placed large, heavy pots all round the bed with the pond in, so he can´t get to it. Not that we leave him unsupervised anyway, but no sense in making it easy! So have lots of pots ready to go, just now need seedlings to put in them... It´s sad when you can´t even find time to sow seeds. Though for me the problem is more that of the conservatory tables now being used as, well, tables and not potting benches. And all of said tables within reach of small fingers of a rapidly growing small boy. I decided therefore to concentrate on getting stuff in when the shed is a decent nighttime temperature, and buy (oops!) other stuff in. Just for this year, so I can stop worrying about the seedlings and just plant stuff. Hopefully next year, when the little man can talk more, I´ll be able to impress the need to stop pulling pots off the table edges! The Easter weekend was typically, as my luck is running, a total washout in the south. Given I´m off to parts foreign at the end of this week and losing two more flipping weekends, I was, to say the least, a bit desperate to get the spuds in. So when today dawned dry, sunny and not too breezy, off I shot. Huzzah! I now have a small bed full of a dozen Charlottes, nicely ridged, and the adjacent large bed with my ten Kestrel, two of the Sárpo Una (the other four I shall pot up at some point) and all ten Sárpo Mira. All are cosily buried with loads of comfrey leaves. To get to this stage was a bit of a tale. The first bed was easy, as it´s been growing self-set leeks and so I´ve got loads of them to eat now. The second bed has been hiding under weed-suppressing fabric for quite some time, and looked like it was weed central on top. Yet none of the weeds were going through the fabric, and so it pulled off very easily. Just needed to sit on the planting board and weed out some grass which was around the edge and didn´t take too long. But the bindweed... why oh why does this ghastly stuff continue happily spreading even when no light is there? Argh! 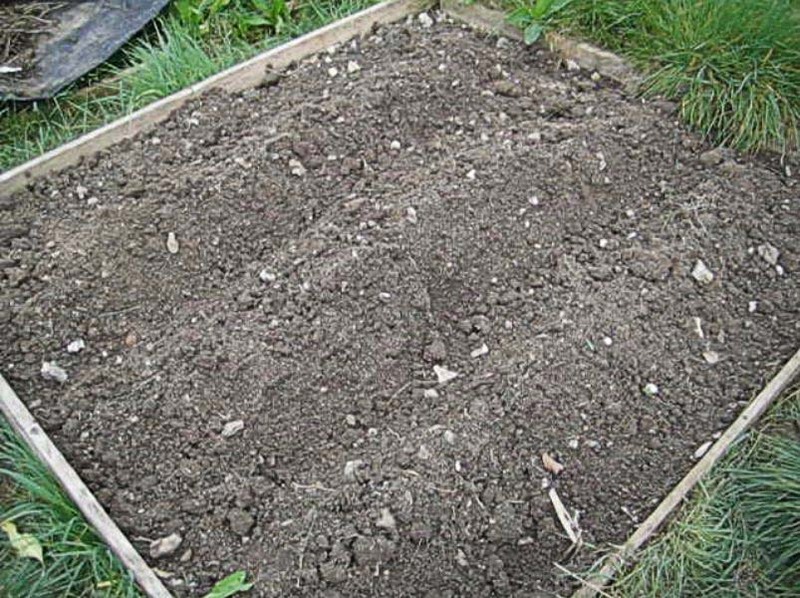 The bed needed digging over properly, but that was a no-no since it was also very claggy - it was one of the more clayey beds - so I just dug holes in the ground and dropped the seed spuds and comfrey into them. No ridges on the maincrops as yet. Yes it´s going to be a bindweed nightmare but at least with the hoeing needed for potatoes, it should keep the weed a bit suppressed and I can have a good go at it at potato digging time. On weed-suppressing, I used the covering off the new spud bed to cover over an adjacent bed, and Chris had kindly covered another one up at the weekend, so that should help weaken a few monster clumps of grass for next time! The highlight of the morning - no fewer than SIX red kites wheeling around and warbling. We´ve had a pair for a while, guess they´ve either got mature youngsters or they´ve just moved in from over the hills. And my cherry fan, despite looking a bit battered, is flowering its head off. About time! I took home a trugful of leeks, four nice young sticks of rhubarb and some salsify. In the afternoon, after I´d got shot of a headache (why do I always seem to have headaches or feel rotten on potato planting day?) I used a nice `any plant half price´ voucher from Van Hage in Chenies to get myself a nice Concorde pear tree. Not sure where it will live permanently as I´ve a lot of re-clearing to do, but meanwhile it will be living in a large pot at home with the quince as its neighbour. More fruit! Postscript to comments earlier: as I´d mentioned I might, I sowed some more saved Purple Venezuelan and Old Mother´s chilli seeds at work a few weeks back: I now have two purples and seven OMs, the latter from guaranteed true seed as they grew at work with no other chillies nearby. Hurrah! Smaller than the other ones so far, but they´ll catch up. Also Tony´s brother has taken over his plot, so keeping it in the family. Good!